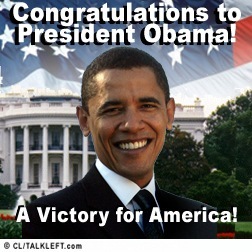 We will live blog President Elect Barack Obama's victory speech. The live blog is below the fold so it can be bigger. You can comment below as usual or send us messages. Update: Transcript of Obama's speech is here. Update 11:21 pm: McCain gives concession speech. 1100 pm: CNN, NBC and ABC News: Obama wins. He's over 270. What time will John McCain concede? What will the final electoral vote count be? What will the voter turnout be? What will the Popular vote be? Should the Networks Call the Election Before the Polls Close? The New York Times reports that CBS and Slate may call the election before the polls close around the country. I hope they do. Why drag it out? Let's begin the celebration early. Here's a very moving video by Israelis who support Obama. Quinnipiac released its final big swing state poll this morning. Obama is ahead in Ohio and PA. Florida is too close to call. "Sen. Obama appears headed for the best showing of any Democratic candidate among white voters in a generation, going back at least to Jimmy Carter in 1976 and perhaps even to Lyndon Johnson in 1964," said Peter Brown, assistant director of the Quinnipiac University Polling Institute. "In the end, Sen. John McCain's troops in Central Pennsylvania, led by veterans, disaffected Sen. Hillary Clinton supporters and God and gun clingers, will be swept over by a wave of young black and urban new voters, giving Sen. Barack Obama the Keystone State," said Clay F. Richards, assistant director of the Quinnipiac University Polling Institute. Public Policy Polling's final state polls are out. It's looking good for Obama among Independents. Obama is also getting more Republican votes than John McCain is getting Democrat votes. To see the actual polls, here's Colorado, Michigan, Minnesota, New Mexico and Oregon. ...Two of the main factors driving Obama’s success in the state continue to be his strong standing with independents and Hispanic voters. He is up 60-36 with voters who don’t identify with either party, and he has a 65-33 lead with Hispanics, the fastest growing voter bloc in the state. In the Senate race, Democrat Mark Udall is now up by 17. Full Colorado results are here (pdf). A new AP-GfK poll in 8 battleground states has Obama ahead or tied in all of them, including four states that Bush won in 2004. The states are: Colorado, Florida, Nevada, New Hampshire, North Carolina, Ohio, Pennsylvania and Virginia. 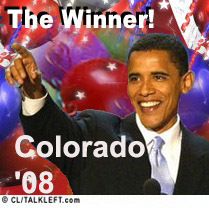 The polling shows Obama leading in Ohio (7 percentage points), Nevada (12 points), Colorado (9) and Virginia (7), all red states won by Bush that collectively offer 47 electoral votes. Sweeping those four — or putting together the right combination of two or three — would almost certainly make Obama president. Obama is winning by double-digits in PA and NH. Ohio has 20 electoral votes, PA has 21 and FL has 27. Nevada has 5, Colorado 9, NC 15 and Virginia 13. A new Arizona poll finds John McCain's lead over Obama reduced to 2 points -- a statistical tie. The same poll last month had McCain up by 7. Today's LA Times/Bloomberg poll has Obama ahead in both Ohio and Florida. The Washington Post reports McCain will focus on the economy in the coming week rather than national secuirty. Does anyone care anymore what he focuses on? McCain Says He Won't "Coddle Criminals"
Via Sentencing Law and Policy where law prof Doug Berman provides his own thoughts, Sen. John McCain has an op-ed today in the National Law Journal outlining his views of criminal justice and the role of judges. Terrorists are not the only threat to public safety. Lax enforcement policies, judges who legislate from the bench and lack of support for law enforcement personnel all continue to force our innocent citizens behind the barred windows of their homes and allow criminals to roam free. And now drugs are bringing waves of crime and organized gang activity to rural areas thought to be nearly immune from such problems. The federal government must both support state and local law enforcement and effectively enforce federal laws designed to root out violent crime, organized gangs and other interstate criminal activity. 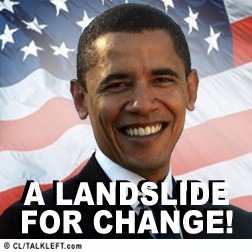 The latest Washington Post Virginia poll has Barack Obama up by 8. As an example of the gains he has made since [the last] poll, Obama is now tied with McCain among college-educated white men, overcoming what had been an almost 30-point deficit for the Democrat. ...Part of Obama's late advantage can be traced to widespread voter unease about the economy, record low approval ratings for President Bush and a growing number of voters who have strongly negative perceptions of GOP vice presidential nominee Sarah Palin. 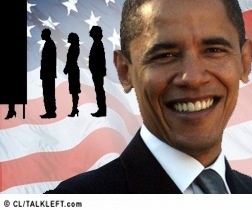 It appears Obama is unstoppable at this point -- so long as all his supporters remember to vote.